The consumer, so it is said, is the king . . . each is a voter who uses his money as votes to get the things done that he wants done. How do you decide to spend your money? 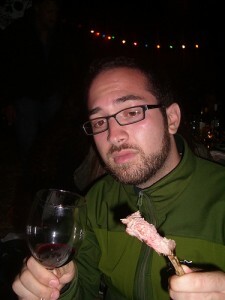 Why did the man in the picture to the right choose the wine and the lamb and not the beer and steak? Most people would say “he just likes the lamb better”. But “likes” doesn’t tell the whole story. I really like steak (I mean I really, really like steak), but I don’t always eat or order steak. Why not? Well, one obvious reason might be because I can’t afford to always eat what I really want. Another reason might be because I want variety. Sometimes it’s nice to have a little of something different. This unit is about how these different factors: what we like, what we can afford, and what variety or balance we want affects our consumption choices. This unit tries to build models of how consumers make choices.Ultimately, any model we build to explain consumer behavior should allow us to derive a proper demand curve from it. The essence of consumer choice models is relatively simple. There’s tastes, a budget, marginal decision-making, and rational choices involved. Explain marginal utility, the utility maximizing rule, and the income and substitution effects of a price change. What Do Consumers Want (in General)? Economists assume that we all want to maximize utility. What’s utility, you ask? Well utility is a simple word that covers all the sense of feelings, desire, usefulness, and benefit we get from consuming a product. You could as easily say “perceived benefit”, but utility is easier. Why you perceive a product to have utility, or how much utility you perceive it to have is subjective — it depends on who you are, what your situation is, and what your tastes are.Economists don’t question tastes or preferences – we just assume you have them. Preferences or tastes aren’t the same for different people. We all have different tastes –“different strokes for different folks”. And it’s not possible to compare utility between different people. TIP: Utility cannot be compared between people, but it can be compared within a person. For example, I tell you clearly whether chocolate chip cookies or coconut macaroons have more utility for me. You could tell me which has the most utility for you. But there’s no way to compare my estimate of the utility of a chocolate chip cookie to your estimate of the utility of a chocolate chip cookie (or anything else). If utility was the only consideration when we make choices of what to consume, then we would all probably just choose unlimited amounts of everything. That would certainly “maximize our total benefit” from consumption! But of course we can’t choose unlimited amounts because we have to buy the goods in a market using our limited budget (our limited resources). Economists use the term “budget” to mean all the money we have available to spend. For most of us, budget is the same as our income, so you can think of budget and income as pretty much interchangeable. Our budget and the prices the market presents to us put a limit on how much we can choose to consume. Our budget “constrains” our attempt to maximize utility, in economist-talk. The next ingredient, after utility maximization and budget constraints, in our model will be an assumption of “rational self-interest”. Economists assume people are rationally self-interested. What this means is that if a person (any person) perceives that option A is better for them than option B, we assume they will always choose option A. That’s all there is to the rational self-interest assumption. The question of why the person perceives A to be better than B is a question of tastes or preferences. The insight that makes our models of constrained maximization, like consumer choice theory, really work well is the assumption of marginal decision-making.We’ve discussed marginal decision-making before, but in this unit we really begin to see its importance. Bluntly put, consumers don’t really choose the total quantities they want to consume of each product, so much as they make an unending series of little choices to have “a little bit more of this” and a “little bit less of that”. These are marginal decisions. When make these incremental choices, we are constantly comparing the marginal benefit to be gained from that incremental increase in consumption versus the marginal cost of what it takes to acquire the incremental amount. TIP: It is time well-spent to make sure you understand the mathematical and graphical relationships between marginal amounts and total amounts of anything (benefits, costs, units). We will be using marginal analyses throughout the next seven units. Do We Really Make Choices This Way? It’s useful to keep in mind that the optimizing and choosing behavior described in this unit isn’t necessarily conscious decision-making by people. What economists have developed here is a model of how people make choices that maximize utility. People may or may not be consciously thinking this way, but the end results of their decisions are the same as if they were. This choice and constrained maximization area of economic theory is one of the strongest areas in economics. It’s also one area where there’s been some experimental “testing” of theories. The Law of Demand and the utility maximizing models presented in this unit reliably predict people’s behavior. In fact, they also reliably predict the behavior of other animals. Experimental tests have shown that birds, rats, mice, and other lab animals all behave as if these incredible utility-maximizing comparisons were being analyzed by them. If you’re curious, go to Wikipedia here. The consumer choice model assumes that consumers try to maximize utility subject to the constraint of their budget, and assumes that consumers are rational and marginal-decision-makers. In the next four units we will see that the same essential model of decision-making can be used to explain how businesses make decisions. obvious in terms of the incomprehensible.